Torque required to lower load calculator - step by step calculation, formula & solved example problem to find the torque required during raising the load by using the square thread (power screw) in power transmission. Load in Newton F, mean diameter dm, mean collar diameter dc, square thread pitch distance l, coefficient of friction for thread μ & coefficient of friction for collar μc are the key terms of this calculation. 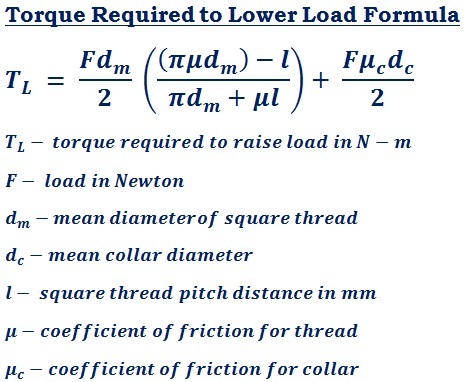 In mechanical engineering, the below mathematical formula is used to calculate the minimum torque required to lower load (TL) for square thread power transmission. The below step by step solved example problem may helpful for users to understand how the input values are being used in such calculations to calculate the torque required to lower the load or horizontally move against the force using the square threaded screw (power screw) in power transmission. A vice using the square thread having the nominal screw diameter d = 14 mm, pitch width p = l = 3 mm, square thread frictional coefficient μ = 0.35, coefficient of friction for collar μc = 0.25, mean diameter dm = 12.5 mm, mean collar diameter dc = 45 mm & the capacity of the vice clamp is 850 Newton. Calculate the torque required to release load of the vice. In the field of power transmission by using square thread or power screw in mechanical engineering, it's important to analyse the torque requirement to minimize the load. The above formula, step by step calculation & solved example problem may be useful for users to understand how the values are being used in the formula to find the minimum torque reuired to decrease the load TL, however, when it comes to online for quick calculations, this power screw torque required to lower the load calculator helps the user to perform & verify such mechanical engineering calculations as quick as possible.